I recently came across the blog lowercase l. Until reading a few of the entries, the case for lowercase l had not previously crossed my mind. However, while on my three day hiatus what did I happen to meet? Well, nothing short of my very first lowercase l sighting!!! I'm so excited that of course I had to share! Would you like to buy some lowercase l pot? The author seems to have known in advance that he would run out of room and prepared by slipping in the lowercase L immediately after jotting down the first capital C. He should also be commended on his fancy kerning with the T in POTS. Don't laugh. 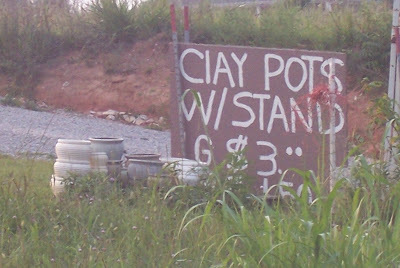 Most gardeners use CIAY POTS in their gardens. Hahaha, I had noticed the l factor, but I hadn't really given it any thought until now. It's very interesting. I lOVE IT! Why the HEll WOUlD you assume a MAlE made the sign? Who the L are You?